Google has been accused of many things, but KILLING A DONKEY? Previous: Yet ANOTHER Java zero-day claimed – but this time you’re laughing, right? Google has been accused of many things in its comparatively short history. The Marketing Monster of Mountain View has felt the wrath of the US Federal Trade Commission on several occasions. But callously running down an innocent pack animal in rural Kweneng District, Bostwana? Someone’s valuable and much loved property? Surely that’s stooping to a whole new level? 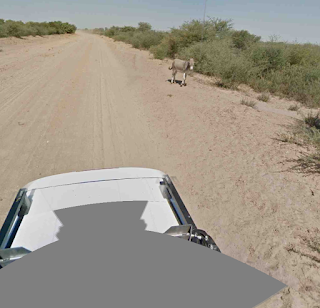 Incredibly, Google not only deaded a donkey, but documented the dastardly deed, and dobbed itself in, on its very own Rural Africa Street View service! Eagle-eyed Google Maps users [Vulture-eyed might have been a better choice, Ed.] found the evidence here, in this sequence of successive Street View photos showing the Googmobile driving callously away from the dead or dying beast. You can see what the problem is with the evidence, can’t you? The photos above are in reverse order. The car isn’t retreating at all. Like most of Southern and East Africa, Botswana used to be under British colonial rule. And whatever regrettable legacies Perfidious Albion might have left in its overseas demenses, there was one thing it got right. Here’s the clue, in a photo taken shortly before the donkey encounter, showing a vehicle approaching in the other direction, but on the right-hand side. Google’s car was travelling, as the law requires, on the left side of the road. The Googlers approached the donkey, slowed down, and stopped to watch. Just like an elephant or a horse might do, the donkey was having a nice dust bath. After a little while it got up and trotted off to the roadside. The Googlers drove on, and Street View was safe. So was Eeyore. The internet’s a fruitful – some would say endless – source of data, much of which simply comes to you by the ultrabyte. But making information out of that data… that still requires your personal thought and attention! Oh, and keep to the speed limit. Especially on dirt roads. Well, it is a dirt road…so it could have got covered in dust by an earlier vehicle, or even by one going in the other direction. So you can still go for the conspiracy theory on those grounds if you want. So I won’t be eating it in my cheapo supermarket beefburger? I can't believe you missed the obvious line to work into the story – "Drop the Dead Donkey". For those of you not old enough it was a great satire on Channel 4! I vaguely recall that this was the instruction to the newsreader to not do (drop) the story about the dead donkey because it was not true. More importantly, there are Street View frames showing the donkey clearly alive (or at least very realistically propped up on all fours 🙂 both in front of and behind the vehicle.